Social networking sites like Facebook are great platforms to find your old friends and make new ones. They are also great to use for generating traffic to any website, particularly a blog website. To generate traffic to your site or blog you have to first create a profile/page for your business. You then add a link to your site or blog with a brief introduction and description of your business. Make it a point to add new people as your Facebook friends everyday as the more friends you have, the more people your profile is shared with; and the more people you can invite to ‘like’ and ‘follow’ your page. The more people who see your website or blog links on your Facebook profiles, the more traffic and potential sales it generates. Start a group related to your business and invite your friends to join your group so that you can prove to them that you are an expert in your industry and use this avenue for generating more sales for your business. Join groups related to your business, and have your friends join them so that you can share your views on your industry, again proving your expertise at your work and thus experience more sales. By creating a FaceBook page, it gets indexed by search engines so that it can be accessed even by people who are not on FaceBook. Organize an event based on or related to your business and use Face book to promote it by inviting all your Facebook friends and thus increase your website traffic. Facebook has a provision where you can advertise either a Face book page or your website and again have more visitors to your site. Further more Facebook is useful as a marketplace to sell your products and services and thus have more visitors to your site. 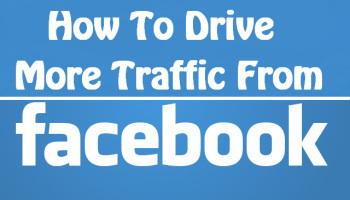 With the help of these tips and the social networking site Face book, you will soon see a marked increase in your website traffic. You need a website or help setting up your Face book page or group?